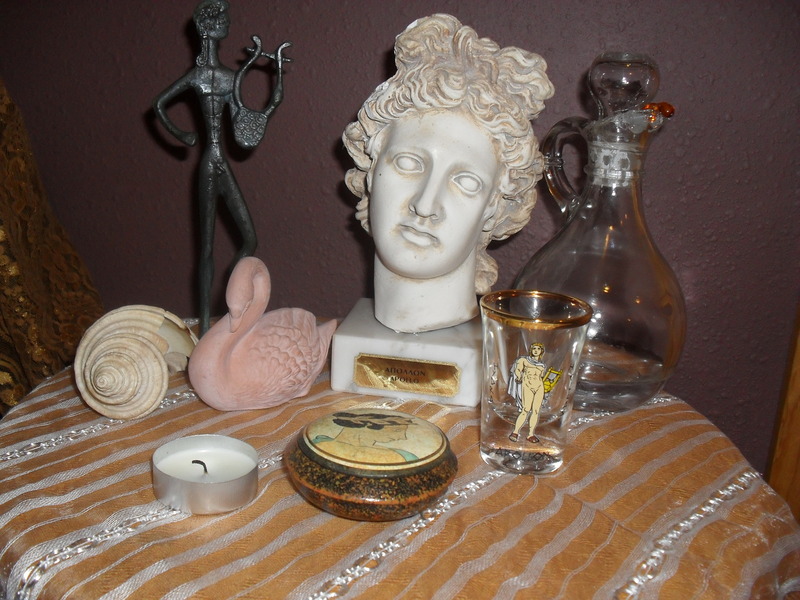 After moving there isn’t much left of my Apollon shrine. I had to part with some of the bigger peices I couldn’t afford to ship but are easily replaced once I have an apartment and more space for them. For instance the plaster column his bust was on. The statue of Apollon capturing Daphne which always struck me on a very personal level I ended up leaving with my roommate, and I trust it is being treasured and well cared for. There is not much to this shrine yet but I am sure it will build up rapidly again 🙂 The small Apollon bowl was a gift from Greece and it contains a small but from a pine at Delphi. The jar has water from the Castillian spring, the top is glued close with hot glue and two amber peices like water drops are at the end. That is my decorative way of perserving the water from the sacred spring. The scarves are from Morocco. The shot glass libation bowl I found at a thrift store and was likely a tourist gift that someone decided that they didn’t want anymore. I once had two swans but the second broke in the mail 😦 Lastly the shell is from the island where I was born. My purpose when I am working on his shrine is that everything is elementally personal and ties into my relationship with him. I have the shell from the island of my birth because in many ways I know he was there and I was made to love him.